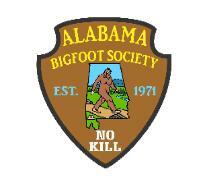 Welcome to the Alabama Bigfoot Society website! she and her staff have completed on Bigfoot DNA. person, a person who's word can be taken, a person who doesn't think they are better than any one else. a very sincere, honest person who's word can be taken. on TV so that means big money for some one. The people on the shows, the creators of the shows and the advertisers. 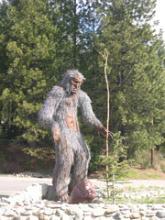 thousands of dollars book deals lots of big name bigfoot people have and will be getting in the future. 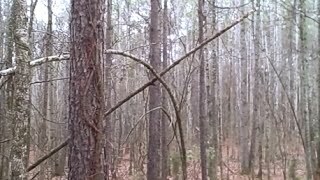 The First Week Of November Brings Two Bigfoot Sightings In Clay Co.
week, (the first week of the month), a large Bigfoot was witnessed by a local resident in a location between the 2 towns. 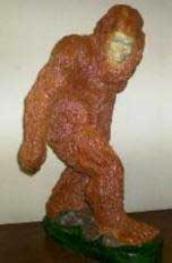 frightened and ran into the safety of their home, although they say the Bigfoot showed no hostilities. them for evaluation since the prints looked human but were about 18 inches long by 5 plus inches wide. says she recognised the prints the second she saw them. Speak at your next gathering or meeting? So we can start planning a time, date, and location. particular formation was discovered in southern Clay County. To, This Almost Human Creature ! Within a month of this discovery, I located three almost identical formations in Horseshoe Bend \National Military Park. contaminating your thoughts, findings or opinions. however we found this on a website and assumed they knew what they were talking about. 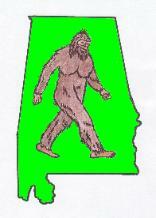 We receive reports from all over Alabama, the U.S., and the world as well. We investigate all those reports possible. mention their identity, existence, or hoax again. donation so we can continue. Any donation is appreciated. hate getting old), Thanks for your patience. We Are Glad To Announce..
We Now Offer Paranormal Counseling ! know well the ridicule that sometimes follows a paranormal episode. please let our experienced staff assist you. You are not alone. Contact us Today!... Through our 'Contact Us' page to set up an appointment. please add about 60, 000 additional visits to the site. Would you be interested in Attending? Only interested in Bigfoot? Well they are all connected. Somehow, Believe me. Seminar & Tour will be 'PRIVATE'. If you'd be interested, please contact us on the contact us page for further information and for cost. This is the sell of the publishing rights and copyrights to the Booklets. through the Contact Us Page. eyesight, I am no longer able to puiblish them. be no age restrictions. All ages welcomed. If you don't have a PayPal account, you can join with payment by POSTAL MONEY ORDER Only. signs are now forever destroyed and has been clear cut.